A few days ago I posted photos of this bedroom and sadly realized it was too blah for the summer. That’s when I ordered the new Laura Ashley quilt from Joss and Main you see here. I love all its fun color and of course, I love that its all flowery and girly! 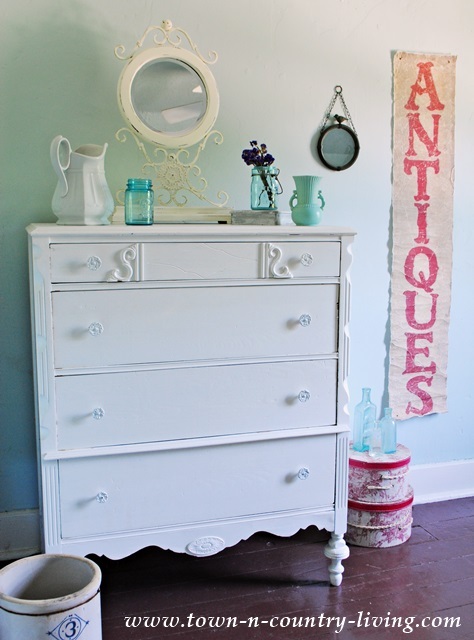 The 5-drawer dresser was an antique store find. It wasn’t in the best of shape so I painted it white. This bed used to be a 4-post Shaker style bed. I got tired of it and had hubby cut the posts down. I added finials to each post and then painted the whole thing white. I like it so much better now. 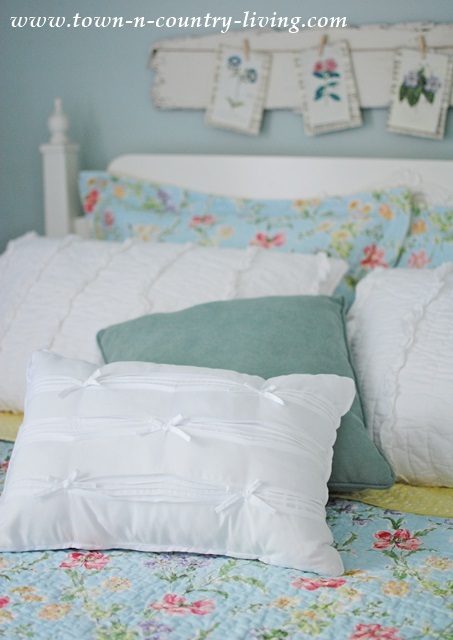 Since I love white, I had to add a few shabby chic style white pillows. Plus I think when you pair color with white, it makes the color stand out even more. On the other side of the room, I have another antique store dresser. This one was already painted white when we bought it. 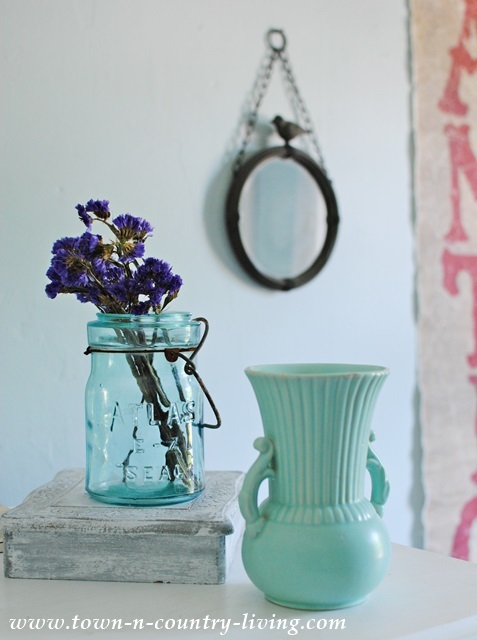 A simple aqua vignette decorates the dresser top. I found the Antiques banner a few weeks ago, thinking I knew where it would hang. But it didn’t look quite right when I placed it at the bottom of the stairway. 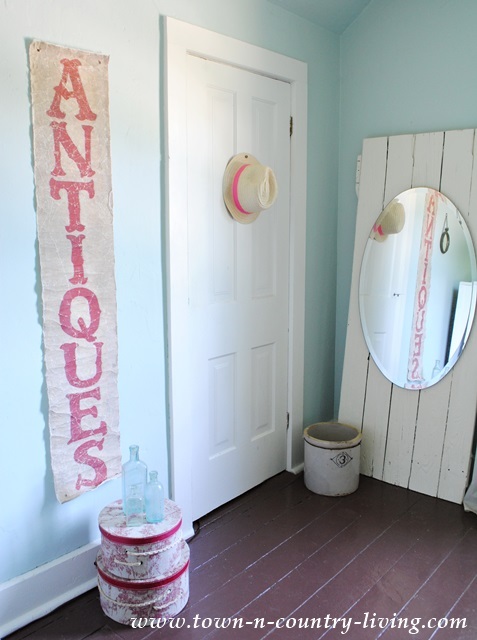 As I was decorating my farmhouse bedroom for summer, it dawned on me to grab the Antiques banner. It fit this space just right! I knew I’d find a home for it eventually. The mirror in the corner was hung on an old farm door that used to be my friend’s coffee table. In the summer, I like to keep the windows open as much as possible. It has to get pretty hot and humid before I’ll turn the air conditioning on. I made the floor-length curtains from white muslin fabric and added pom-pom trim to the valance. You might remember that the board above my bed used to say Sweet Dreams. I grew weary of it so I painted over the text and hung my botanical print banner. I simply tore pages of sheet music and printed off botanical drawings. Then I stretched a piece of twine from end to end on the painted barn board. 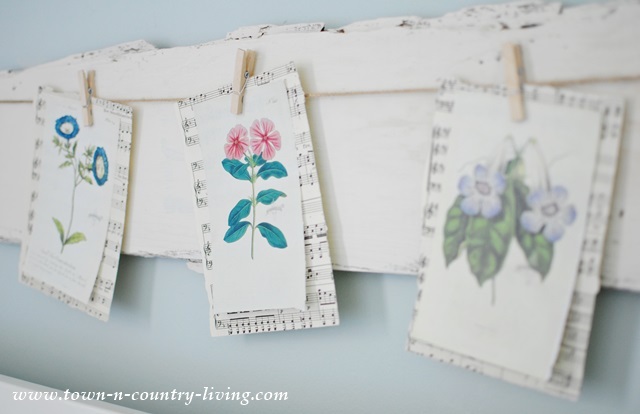 Then I hung each botanical print on the twine with a wooden clothespin. Now I can simply swap out the artwork depending on the season. 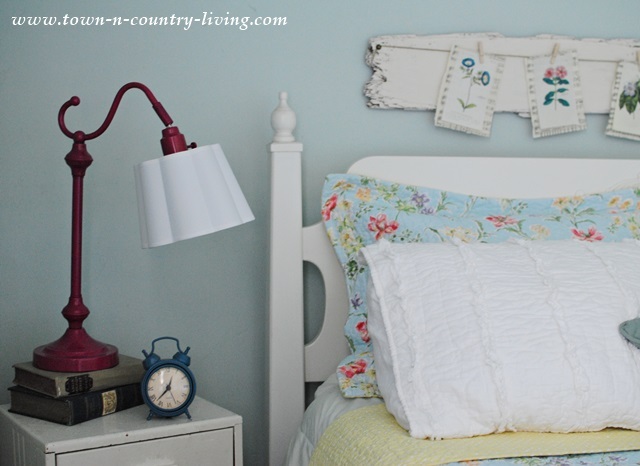 One more new addition to my farmhouse bedroom is the adorable raspberry-colored lamp. I love it!! I found it by chance at Target a few days ago and knew it would look cute in here. I made quite a few changes in this bedroom, but I didn’t really spend a lot of money. I used stuff I already had and what I did buy was on sale … except for that cute little lamp! 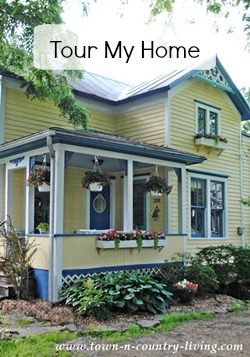 You can see more of my summer changes at my Summer Home Tour! 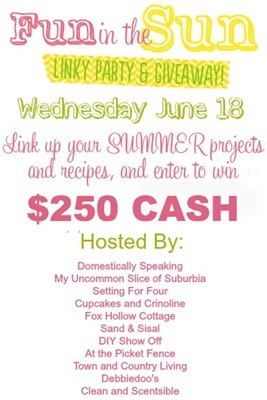 Come back tomorrow to link up your own summer project and enter the $250 cash giveaway!! 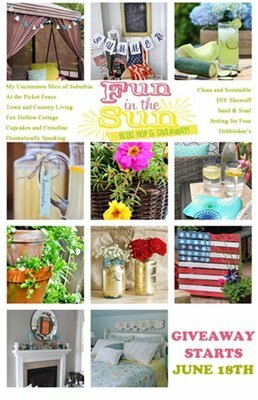 Until then … check out the rest of these bloggers’ amazing summer Fun in the Sun projects! Love love love this bedroom! The raspberry lamp is fun and I love your banner over the bed. What a beautiful spot! This bedroom looks so crisp and perfect for summer. Love everything you’ve done in here!! It’s stunning! I like it. better than mine…. What a gorgeous decor job you’ve done – I love that clock too. Such a pretty room! It’s a beautiful room, Jennifer. Your new bedding is very pretty – I love the colors. Your banner above the your bed is a great idea too! Beautiful room. I love the color. So relaxing. What a pretty room. 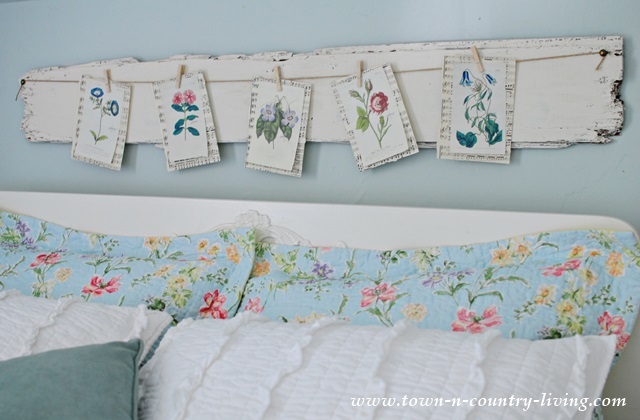 I love the flower banner over the headboard. The room is gorgeous. This room is so beautiful. Your new quilt is just perfect and I love how you took that pinky red from the flowers and sprinkled it throughout the room. So relaxing and perfect for summer! Fun, fun fun! So fresh and pretty. I love the colors mixed in with your whites. The little board and banner over the bed is darling. I super love that!!! 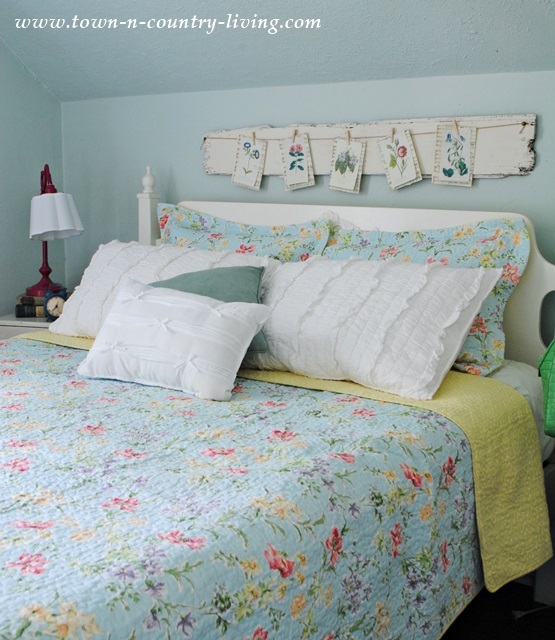 your bedroom is light and fresh with the beautiful colors on the quilt,my favorite is the botanical prints,it makes the little attention to details perfect! Very pretty and summery, Jennifer! 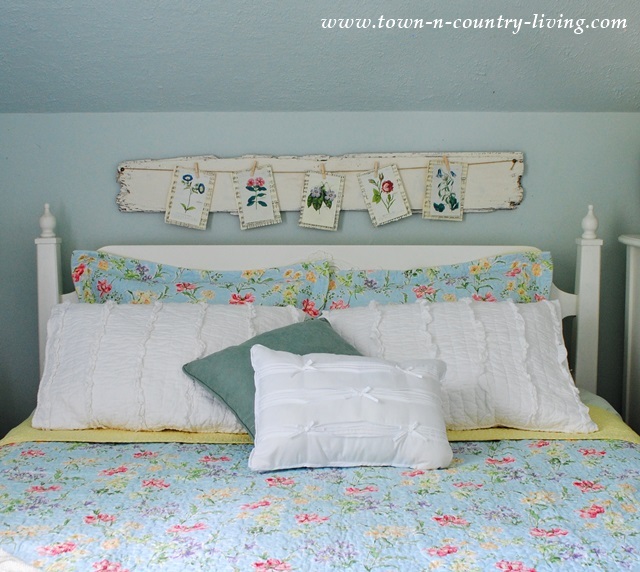 I love how your vintage botanical banner goes with the floral bedding. 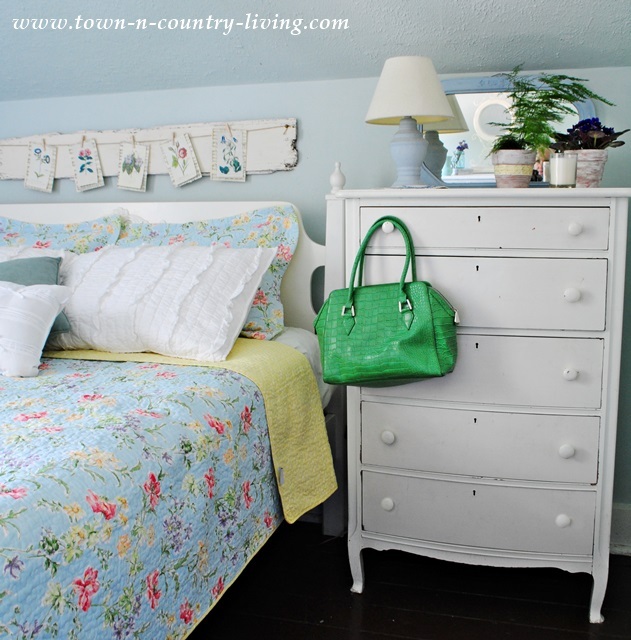 Love the dressers, too, and the lamp was a really cute find! Hi Jennifer, I love your summer bedroom! 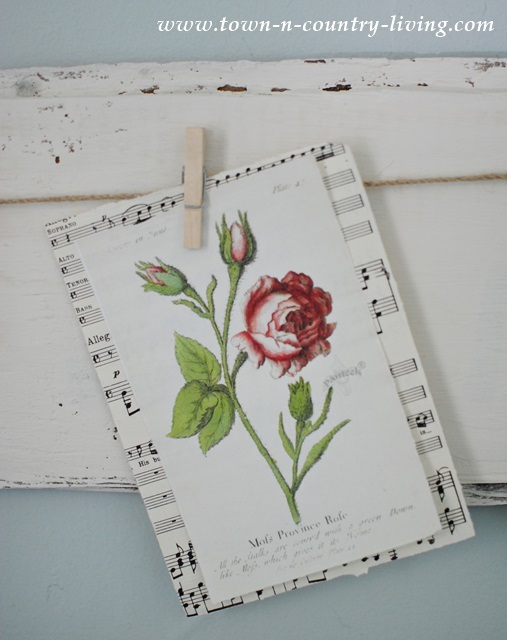 The botanical banner you made is so sweet, the sheet music adds a whimsical touch! The blue and white color scheme looks so fresh and airy, perfect for summer. 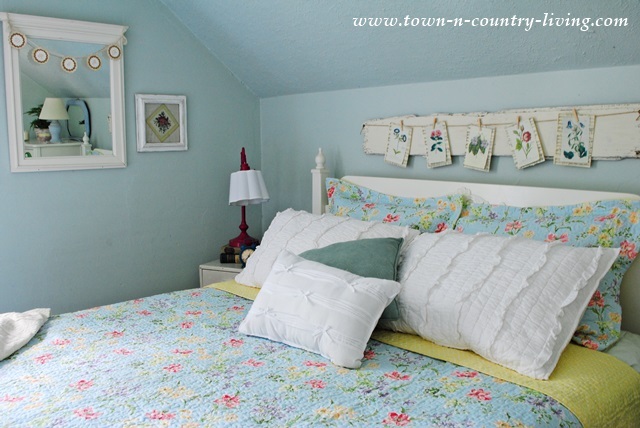 What a beautiful summer bedroom… so calm with those colors! LOVE it! So pretty!! I love the lamp too 🙂 your too is so summery and cozy looking. I adore everything. 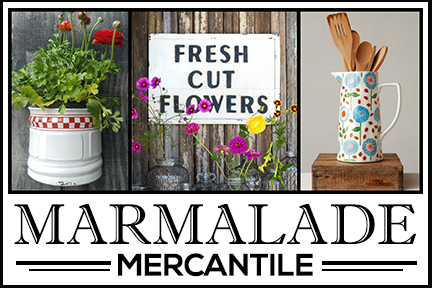 The botanical banner is such a sweet summer touch! 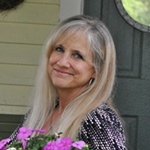 I love it all and I’m so happy to have found your blog. The bedroom is beautiful! Awwww. It’s lovely. Perfect for Summer, and year round, actually! I love that little red lamp. What a great find! I love Target so much. I wish we had one closer to us. LOVE, LoVe, Love this room!! And that bed cover, WOW, so pretty. You have some serious deco skills. Very glad to have found you in this Summer Hop! Your room turned out gorgeous Jennifer. I had no doubt. The colors are so pretty and I love what you did over the bed. So simple but a beautiful impact. Jennifer, this is the cutest room. 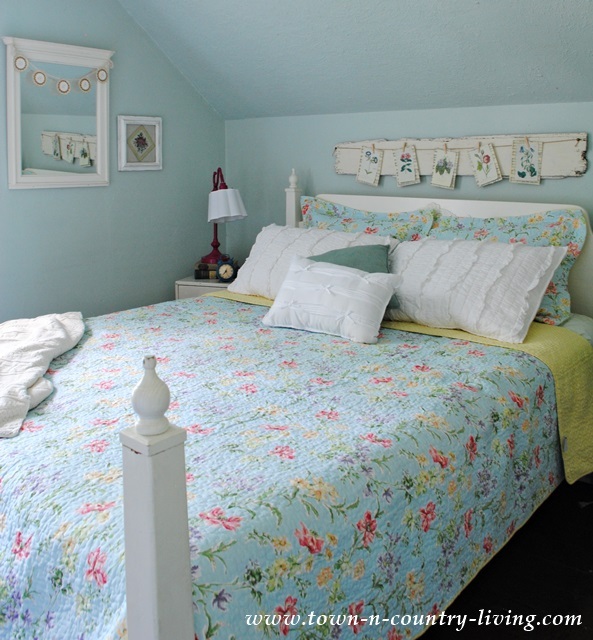 I love all the colors and the cute decor above the bed. 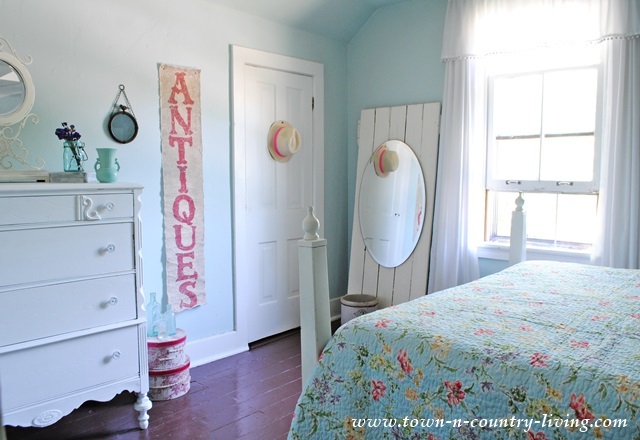 Your bedroom has all of the elements of perfect farmhouse decor. Absolutely gorgeous! Your room looks like heaven, if I died sleeping in that room I’d be very content. Your room is so soft, welcoming and serene. Everything you’ve done in that room is perfect. The quilt, everything, you’ve inspired me so much, I’ll be borrowing some of your ideas, love that lamp and banner, all of it. I want to make a banner for a big wood gate hubs made for me last year. I like to change out the items on it, keep it very cottage looking. Time to paint the room, going to be coral on walls and apple green for some of furniture and frames. Your room really influenced me to start on our room. We have a good sized waterfall chif-a-robe I want to paint apple green. It’s been white since I bought it in KY but time for a change. Whenever our daughter comes over with her girls they like to go in our room, say it looks so nice for a nap, is kind of old fashioned looking with the furniture. Happy summer days to enjoy with your family. What a cute bedroom! 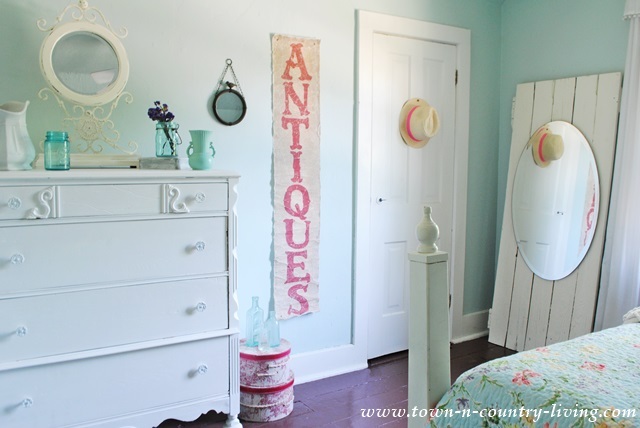 I love how the painted dresser makes all of it’s curviness pop! What a beautiful bedroom! 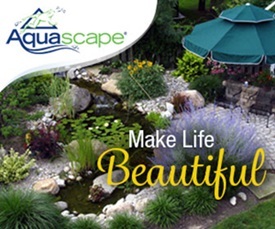 So calm and relaxing – perfect for summer! 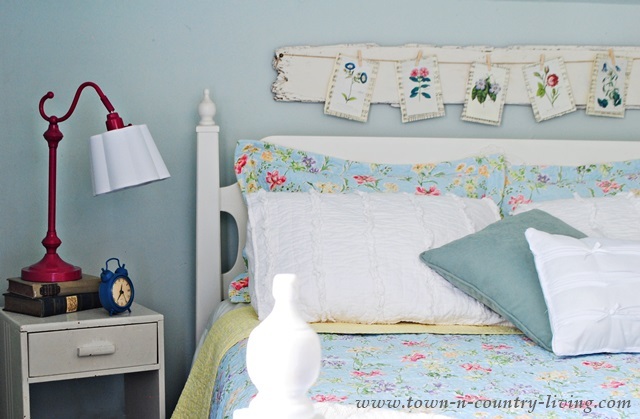 Such fabulous little touches – love the clip board above the bed. Such a pretty room! I especially like the colors, the simplicity, and the light-hearted feel.